Discussion in 'Gibson SG' started by bgio, Sep 8, 2018. Hello all. First time poster here, but long time lurker. I noticed that there isn't a ton of info/reviews on newer Custom Shop SGs, so I figured I would post about mine. I have been looking for an awesome small guard SG for a long time. About 3 years ago, I purchased a used USA 61 RI that I really liked. I ended up putting some upgraded nickel hardware and a ABR-1 conversion from Philadelphia Luthier Supplies on it. That made a noticeable difference in sustain for whatever reason. But I kept gravitating to wanting a Custom Shop. I have two Custom Shop Les Pauls, so I wanted to try a CS SG. Shameless plug: the 61 RI is up for sale in the classifieds... It really is a great guitar. I live in rural AZ, so I don't have a lot of options to try out gear anymore. So I ended up purchasing two at the same time from Chicago Music Exchange: a 2013 and a 2018 with the plan of returning one. CME was extremely helpful through the process and I can't thank them enough. Both guitars had the newer historic specs including hide glue, custom buckers, new dyes, etc. After having both guitars for the weekend, it was a pretty easy decision. In reality, both guitars were very similar. They both played and sounded very similar. The 2018 was essentially brand new, while the 2013 had a decent amount of dings and the finish on the front of the guitar had faded to that orangey brown. I wanted to the deeper cherry, though I know it will eventually fade a bit. So the 2018 is a phenomenal guitar. It still smells brand new. It plays fantastic. It has a similar but unique sound when compared to my Les Pauls and ES-335. I love the Custombuckers. It is exactly what I wanted in an SG. Satellitedog, Tim Plains, michaelinokc and 13 others like this. Congrats on the new guitar, gotta love the '61 style SGs, they are my favorite! I didn't know they started putting double rings on the Historics. Nice! How's that Fryette Power Station working out for you? I’m lucky to have the things I have. 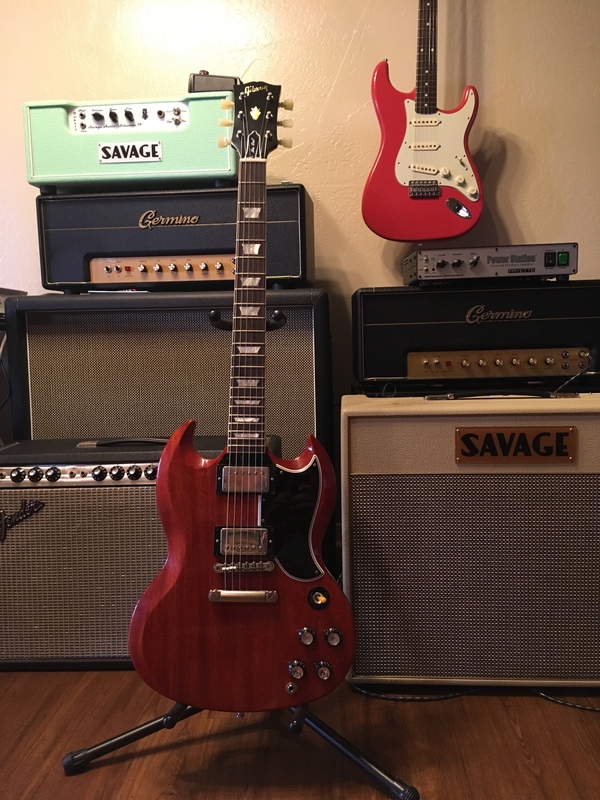 I’ve been trying to downsize, so I’ve sold some guitars to acquire this SG. A couple amps in closets that I’m trying to move as well. I really like the Power Station. It does what it’s supposed to do and it does it well. One thing that it’s really taught me is there is no substitute for volume. While the PS allows the amp to get into saturation and react as if it’s cranked (well it is...), there’s a change in feel because of the loss of volume. That being said, I use it at almost all of my indoor gigs. It also makes the wife happy! syscokid and arcticsg like this. I’d love to try a CS SG. You never see them around here (Canada). Agreed, I ordered mine from Sweetwater. But your right, I have never seen an SG VOS on a acanadian store. Not even the massive stores with loads of guitars. I was hesitant about the VOS when I first read about them. Not sure how I felt about the whole relic thing. But the VOS is this perfect combo of a brand new guitar, with just a touch of character. As an OCD individual it helps me a bit, I see a small mark on one of my SG’s and my blood pressure goes up. The VOS is exponentially more money, and when I see a mark I just think, “ah, that’s let of the VOS treatment”, lol. All in all they are pretty classy guitars, and I have been over the moon with mine. Very nice. The Pelham blue SG in my profile pic has a set of Custom Buckers. They sound great in an SG!